What is Autism Awareness Month like for someone who is autistic? Does it make a difference, or is the month a more difficult time for them? 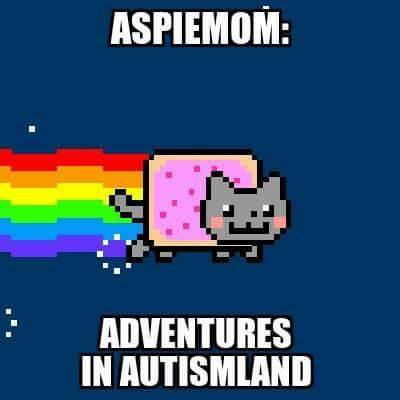 Here Maria, who is autistic, mum to two autistic children, and author of the Facebook page Aspiemom: Adventures in Autismland, shares with us why, for her, April is the hardest month. April, as you may know, is Autism Awareness month. Time to flood social media with posts about “Different Not Less”, how many children are diagnosed with Autism as opposed to previous years, etc, etc. It’s when the anti – Autism speaks campaigns come into play, the anti-vaxxers come out of the wood works, the arguments over whether to “light it up” blue or red, “colour the world”, or to “tone it down taupe” begin yet again. Not knowing what to post, or not post is so frustrating. No matter what you post, someone disagrees. For some, to be an Autistic adult being inundated by a constant barrage of “cause and cure” propaganda or (hopefully) well meaning posts from non-Autistics about awareness and acceptance (which make us feel like we are broken, damaged, or like we have to remind people that we are people too), can be exhausting. It’s easy to forget sometimes that Autistic children grow up to be Autistic adults. To those who are not part of the Autism community, they have no clue what it’s really like. To be caught in the middle. To not know who, or what to support. Nobody likes functioning labels vs they are necessary for support. Talks of what therapies are and aren’t good. Anger over people even suggesting that Autistics need “curing”. Debates over Autistic vs person with Autism.-is it a part of who they are, or something they have? People arguing over whether it’s a condition, or a disorder, or a disability, or none of the above. There is also a division between #ActualAutistics and “Autism Parents”. Those on the Spectrum feel that parents shouldn’t be called that unless they are in fact, actually Autistic. Others say that as parents of Autistics, they are entitled to the title, because they live with an Autistic person every day. Their every waking moment revolves around their Autistic child, so they feel that the title is deserved. Then there are those who are both Autistic and parents. Adults who may be “higher functioning” themselves, but who may have children on varied levels of the Spectrum. With so much division in the community, it is hard to find their place amongst it. We are fighting for our children to be accepted and included not in spite of their Autism, but as human beings; yet we can’t even accept each other within the community. It is full of drama and cliques. It’s like being in high school all over again. We are so busy arguing over semantics, politics and trivial matters that we forget what we are really trying to do. Our children (and in some cases ourselves) are not defective. They are different. Their minds are wired in a unique way that makes them see and do things differently than others. Do they have challenges and struggles that we hate to see them go through? Of course. The thing is, they are trying to adapt to a world that wasn’t made with inclusiveness in mind. It was made for non-Autistics. All we want is for the world to be safe and welcoming for everyone. Autistic and non-Autistic. For those with disabilities, and those with “different” abilities. We need to stop fighting. It’s unnecessary. We ALL have the right to our OWN opinions. To say what we honestly feel. Without being judged by others. How can we ask for others not to judge us and our children, if we can’t stop doing it to each other? Unfortunately, nobody is going to agree with you 100% of the time. You will always have a critic, and someone will always be offended. At the end of the day, Autistic or not Autistic, we’re all people. We all deserve to be on this planet as much as anybody else.